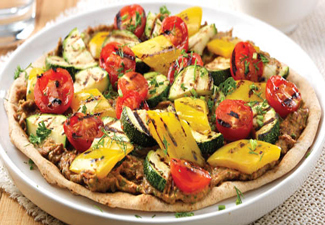 This fab recipe for grilled vegetable flatbreads is not only delicious but is also great for ensuring a healthy heart and can help lower your cholesterol – talk about guilt free cooking! 2. Slice the courgette. Deseed the pepper and slice into pieces. Halve the cherry tomatoes. 3. Brush the vegetables lightly with the olive oil and grill for a few minutes until golden brown. Turn every now and then. Sprinkle with black pepper. Halve the courgette slices. Use hot or cold. 4. Roughly chop the herbs. Rinse and drain the kidney beans. Soak the sundried tomatoes in water. 5. Using the hand blender, whizz together the Flora pro.activ, kidney beans, sundried tomatoes and spring onion. Add half the herbs and black pepper to taste. 6. Divide the flatbread in 2 and place on 2 plates. Spread with the tomato and bean topping. Arrange the grilled vegetables on top. Sprinkle over the remaining herbs and black pepper. Fold over and serve immediately.